Year to date [the fund] has returned 6.5%, beating the 1.2% for the Standard & Poor’s 500 index, and the 5.7% for its benchmark, the Russell 1000 Growth Index. The fund has beaten 93% of its large-cap growth peers in the past five- and 10-year periods. The current manager took over the fund at the beginning of July 2009, so that date will serve as a starting point for our further analyses. The prospectus benchmark for the fund is the Russell 1000® Growth Index. One of the low-cost implementations of this index is the iShares Russell 1000 Growth ETF (IWF). Alpholio™’s calculations show that the fund returned more than the ETF in approximately 88% of all rolling 36-month periods, 65% of 24-month periods and 71% of 12-month periods. The median amount of rolling 36-month outperformance was about 5%. The fund produced about 0.7% of the regular and 1.3% of the lag annualized discounted RealAlpha™ (to learn more about this and other performance measures, please visit the FAQ). Most of the positive RealAlpha™ was generated over just one year beginning in the second quarter of 2013. At 15.4%, the fund’s standard deviation was a bit higher than that of its reference ETF portfolio. The fund’s RealBeta™ was around 1.13. 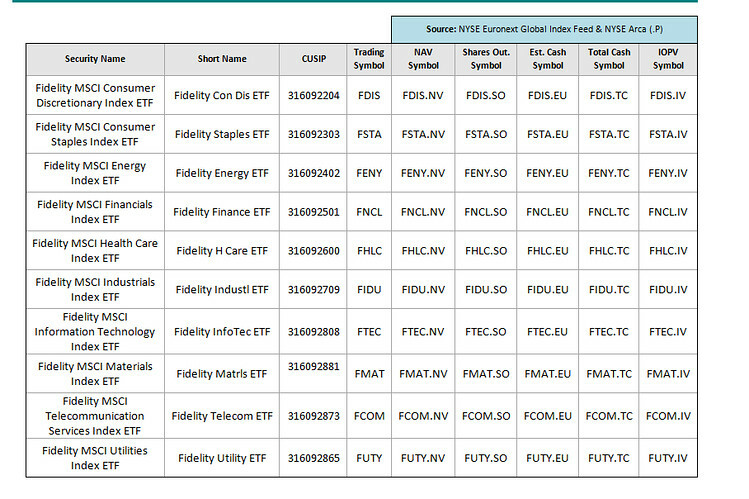 The fund had major equivalent positions in the iShares Morningstar Large-Cap Growth ETF (JKE; average weight of 30.7%), PowerShares QQQ (QQQ; 19.5%), iShares S&P Mid-Cap 400 Growth ETF (IJK; 12.4%), Vanguard Consumer Discretionary ETF (VCR; 11.0%), iShares Morningstar Mid-Cap Growth ETF (JKH; 7.1%), and iShares Russell 2000 Growth ETF (IWO; 5.3%). The Other component in the chart collectively represents additional five stock ETFs with smaller average weights. Under current management, the Fidelity Blue Chip Growth Fund added a decent amount of value on a truly risk-adjusted basis; however, its outperformance was concentrated in a relatively short period of time. This actively-managed fund’s reasonable expense ratio adds to its appeal. Although consisting mostly of long-term capital gains, the fund’s recent substantial distributions (over 5% of NAV in each of 2013 and 2014) made it less suitable for taxable accounts. To learn more about the Fidelity Blue Chip Growth Fund and other mutual funds, please register on our website. For 18 years, […] has successfully navigated through real estate booms and doldrums, beating two-thirds of his peers over 15 years, and 85% over five. The primary prospectus benchmark for the fund is the S&P 500 Index. The secondary, and a more relevant, benchmark is the Dow Jones U.S. Select Real Estate Securities Index. While there is currently no ETF available that tracks this index, one of close long-lived approximations is the iShares U.S. Real Estate ETF (IYR). Alpholio™’s calculations show that since July 2000, the fund returned more than the ETF in about 89% of all rolling 36-month periods. An alternative reference for the fund is the SPDR® Dow Jones® REIT ETF (RWR). Since September 2001, the fund returned more than this ETF in about 52% of all rolling 36-month periods. Yet another reference for the fund is the Vanguard REIT ETF (VNQ). Since October 2004, the fund outperformed that ETF in less then 26% of all rolling 36-month periods. However, in all three comparisons only total returns but not risk of the fund and ETFs were taken into account. Let’s take a closer look at the performance of Fidelity Real Estate Investment Portfolio on a risk-adjusted basis. Applying Alpholio™’s patented methodology, a reference portfolio of ETFs is constructed to mimic the fund. In the simplest variant of the methodology, the reference portfolio has both fixed membership and weights. This type of analysis shows that since late 2004, the fund produced around minus 0.15% of annualized discounted cumulative RealAlpha™ (to learn more about RealAlpha™, please visit our FAQ). The fund had just four equivalent positions in the iShares Cohen & Steers REIT ETF (ICF; constant weight of 51.2%), SPDR® Dow Jones® REIT ETF (RWR; 24.8%), Vanguard REIT ETF (VNQ; 21.3%), and iShares Transportation Average ETF (IYT; 2.8%). Since late 2004, the fund’s cumulative RealAlpha™ has been largely flat to negative. The annualized discounted cumulative RealAlpha™ was around minus 0.1%. At about 26%, the fund’s standard deviation was 0.5% higher than that of the reference ETF portfolio. The fund’s RealBeta™ was about 1.13. The fund had only four equivalent positions in the SPDR® Dow Jones® REIT ETF (RWR; average weight of 40.9%), iShares Cohen & Steers REIT ETF (ICF; 35.4%), Vanguard REIT ETF (VNQ; 20.9%), and iShares Transportation Average ETF (IYT; 2.8%). Over the past ten years, the truly risk-adjusted performance of the Fidelity Real Estate Investment Portfolio was unexceptional. Although the fund’s expense ratio is low compared to an average of its category, active management did not add any value. The fund could have easily been substituted by a combination of just a few major real-estate ETFs. It is also symptomatic of a defunct methodology that the article emphasizes comparisons of the fund’s performance to that of its peers (who collectively underperform benchmarks) rather than to ETF alternatives. To learn more about the Fidelity Real Estate Investment Portfolio and other mutual funds, please register on our website. Magellan has posted average annual returns of 20.3% from Sept. 16, 2011, when Mr. Feingold took over, through the end of August, trailing its benchmark, the S&P 500, at 21.2%, while matching the Russell 1000 Growth Index, according to data from Morningstar. But its returns in that period are above the 18.7% annual average for its peer group, large-cap funds. The fund’s longer-term record remains inferior. Magellan’s average annual return over the 15 years through August was 3%, lagging behind the 4.5% average for its peers, according to Morningstar. In that period, the annualized discounted cumulative RealAlpha™ for the fund was a negative 4.25%, while the lag one was a negative 3.25%. The fund’s was also quite volatile; its standard deviation was about 18.5% and RealBeta™ over 1.15. The primary prospectus benchmark for Fidelity Magellan is the S&P 500® index. One of the practical implementations of this index is the SPDR® S&P 500® ETF (SPY). Alpholio™’s calculations show that the fund returned more than the ETF in less than 42% of all rolling 12-month periods in the past 10 years. The median underperformance was about 2% and the mean one about 1.2%. However, in the much shorter time span under current management, the fund’s performance has been quite different. For one, the fund’s returns beat those of the ETF in about two-thirds of all rolling 12-month periods. The median outperformance was about 1.8% and the mean one about 1.4%. In that period, the fund’s generated about 0.6% of regular and about 2.2% of lag annualized discounted RealAlpha™ (to learn more about the regular and lag RealAlpha™, please visit our FAQ). The fund also dialed down on risk: its standard deviation fell to 10.7% (about 0.4% above that of the reference ETF portfolio) and its RealBeta™ decreased to 1.02. The fund had top equivalent positions in the iShares Morningstar Large-Cap Growth ETF (JKE; average weight of 28.1%), iShares Core S&P Total U.S. Stock Market ETF (ITOT; 16.4%); Vanguard Consumer Discretionary ETF (VCR; 12.1%), iShares S&P Mid-Cap 400 Growth ETF (IJK; 11.5%), Vanguard Health Care ETF (VHT; 8.9%), and Vanguard Energy ETF (VDE; 5.7%). The Other component in the above chart collectively represents five additional ETFs with smaller average weights. Over the past three years under new management, the Fidelity Magellan Fund has significantly improved its performance and lowered its risk. Unlike in the past, the fund has recently generated a modest amount of positive RealAlpha™. However, the fund’s substantial asset base coupled with a large number (currently 160) of holdings may make future outperformance difficult. It should also be noted that in the past year the fund generated a considerable amount of long- and short-term capital gains, totaling about 12.5% of the net asset value (NAV). Such a lack of tax efficiency makes the fund less suitable for taxable accounts. To learn more about the Fidelity Magellan and other mutual funds, please register on our website. Normally investing at least 80% of assets in securities principally traded on NASDAQ or an over-the-counter [OTC] market, which has more small and medium-sized companies than other markets. Investing more than 25% of total assets in the technology sector. The fund’s prospectus benchmark is the NASDAQ Composite® index, whose practical implementation is the Fidelity NASDAQ Composite ETF (ONEQ). Alpholio™ calculated that since the current manager took over, on average the fund returned 1.94% more than the ETF in each of the rolling 12-month periods. However, the median difference was 3.35%, which indicates that the majority of differences were much smaller (i.e. a left skew of the distribution). The fund’s rolling returns beat those of the ETF about two-thirds of the time. Alpholio™’s calculations also indicate that the fund’s returns were quite volatile. Since the new manager took the helm in mid-2009, the fund’s annualized standard deviation of 18.3% was higher than 16.1% for the ETF. As a result, at 1.12 the fund’s Sharpe ratio (a simplest measure of risk-adjusted returns) was smaller than 1.20 for the ETF in the same period. The fund’s cumulative RealAlpha™ was unremarkable except for a brief and rapid rise in mid-2013. Overall, the annualized discounted RealAlpha™ of the fund was about 2% on a regular and about 1% on a lag basis (to learn about the difference between these two measures, please visit the FAQ). The lag RealAlpha™ curve was below its regular counterpart, which means that not all new investment ideas worked out as well as expected. The volatility of the reference ETF portfolio was lower than that of the fund by about 1.5%. As expected based on the fund’s declared strategy, the PowerShares QQQ™ ETF (QQQ) was the largest equivalent position with an average weight of 44.2%, followed by the Vanguard Small-Cap Growth ETF (VBK; 22.1%), iShares Russell 2000 Growth ETF (IWO; 7.6%), SPDR® Morgan Stanley Technology ETF (MTK; 7.6%), iShares Nasdaq Biotechnology ETF (IBB; 5.8%), and iShares North American Tech-Multimedia Networking ETF (IGN; 5.5%). The Other component in the chart represents two more ETFs will smaller average weights. An investor following this signal would have avoided a period of fund’s relative underperformance from late 2011 through early 2013, while capturing the aforementioned strong rebound in mid-2013. This analysis demonstrated the importance of focusing on a shorter tenure of the current manager instead of assessing a full historical performance of a fund. On a truly risk-adjusted basis, Fidelity OTC Portfolio generated a modest amount of RealAlpha™ most of which accrued during six months in mid-2013. Since then, the fund’s cumulative RealAlpha™ has been largely flat. Therefore, there is currently no indication that the fund will significantly outperform its reference ETF portfolio in the near future. To learn more about the Fidelity OTC Portfolio and other mutual funds, please register on our website. A recent article from Morningstar illustrates the problems with categorizing mutual funds. To better compare the performance of mutual funds, Morningstar introduced categories back in 1996. While the investment objective stated in a fund’s prospectus may or may not reflect how the fund actually invests, the Morningstar category is assigned based on the underlying securities in each portfolio. Established funds are categorized twice a year, while the newer ones every quarter. Categories continually evolve to support a more granular and accurate classification of funds. The firm currently uses 106 different fund categories. Some funds may not lend themselves to an easy categorization because of an eclectic or frequently fluctuating investment strategy (not to be confused with a stated objective). The article demonstrates the last of the above flaws by describing problems with an accurate classification of the Osterweis (OSTFX) and other funds. The Osterweis Fund is currently assigned to the domestic Mid-Cap Blend category, even though its holdings span a broad range of market capitalization and include foreign stocks. This is where Alpholio™’s approach comes to the rescue. Our methodology addresses all of the above problems by comparing each fund against a custom reference portfolio of ETFs. The reference portfolio is constructed without any preconception of a fund’s category (although we use a small set of “categories” to narrow down the fund search). Moreover, unlike a static category assignment, the reference portfolio is dynamic in terms of both the membership and weights of its members. This adapts the reference to any changes in the fund’s investment profile and makes the performance assessment (i.e. RealAlpha™) portable across categories. In addition, our analysis does not rely on a periodic disclosure of fund holdings, which itself suffers from numerous problems. It also avoids issues related to the changing classification of individual holdings in a fund, which is inherent in a “bottom-up” analysis (for example, consider the stock of Apple Inc., which could be classified as growth or value depending on one’s point of view). After an equivalent position in the iShares 1-3 Year Treasury Bond ETF (SHY; average weight of 24.6%) representing short-term investments, the fund’s equivalent position with the second highest average weight was in the iShares Core S&P Mid-Cap ETF (IJH; 13.6%). The latter explains why Morningstar classified the fund into the Mid-Cap Blend category. The above chart also shows that at times the equivalent position in IJH was nonexistent, which brings into question a stationary classification of the fund into the Mid-Cap Blend category in the past ten years. As in the case of OSTFX, the ETF weights for FLPSX significantly fluctuated over the nine-year analysis period. For example, the equivalent position in VO was as high as 57.2% and as low as 0%, while JKJ oscillated between 44.8% and 2.2%. Therefore, a fixed classification of this fund into the Mid-Blend category since 2005 is dubious. In conclusion, Alpholio™’s innovative approach alleviates the disadvantages of a simplified categorizing of mutual funds. The traditional classification methodology will continue to suffer from its inherent tradeoff among the number, accuracy and persistence of categories assigned to mutual funds. Over the past few years, stock fund managers have struggled mightily to beat their indexes consistently, but you’d never know it by looking at the track record of Fidelity’s William Danoff. The 23-year veteran and manager of the flagship $111 billion Fidelity Contrafund (FCNTX) is beating the S&P 500 over the trailing one-, three-, five-, 10- and 15-year trailing time periods as of Jan. 17, according to Morningstar Inc.
First, it has to be noted that for the past eleven years Morningstar classified FCNTX in the Large Growth category, while the S&P 500® index is traditionally considered a benchmark for Large Blend funds. Therefore, it may be more appropriate to compare the performance of FCNTX to that of an large-cap growth index fund, such as the Vanguard Growth Index Admiral (VIGAX). It turns out that in terms of returns, FCNTX beat VIGAX in each year from 2003 to 2008 but in no year afterward until 2013. This caused the annualized three- and five-year returns of FCNTX to be lower than VIGAX’s. However, FCNTX outperformed VIGAX in terms of the Sharpe Ratio over the three-, five-, ten- and fifteen-year periods. In 2013, there was no material change in risk-adjusted performance of the fund until the second half of the year. However, after peaking in October, the cumulative RealAlpha™ declined in the last two months. While for the year the fund managed to return 1.75% more than VIGAX, Alpholio’s longer-term assessment of FCNTX stayed the same. Even prior to 2009, the fund’s cumulative RealAlpha™ was roughly flat, and since then, the fund mostly failed to beat its reference portfolio of exchange-traded funds (ETFs). Since early 2005, the fund’s annualized RealAlpha™ was negative 1.35% with respect to a reference portfolio of comparable volatility. In 2013, the reference portfolio continued to be dominated by the iShares Morningstar Large-Cap Growth ETF (JKE; average 12-month weight of 51.3%), iShares Morningstar Mid-Cap Growth ETF (JKH; 14.4%), Vanguard Health Care ETF (VHT; 10.0%), and PowerShares QQQ™ ETF (QQQ; 5.4%). In sum, from Alpholio™’s perspective there does not appear to be any indication of a permanent change in the fund’s longer-term performance. Since 2005, investors would have achieved better results with a reference portfolio of ETFs and, in the last several years, higher returns with a comparable index fund. To get more information about Fidelity Contrafund and other mutual funds, please register on our website.